There are many great cocktails for Halloween and some of them, admittedly, are more gimmick than taste. On the other hand, there are quite a few "martinis" that are sure to impress anyone while retaining some of the creepy fun. From "deadly" classics to frightful modern mixes, these are some of the best drinks you'll serve at your Halloween party. Add absinthe to the classic gin martini and you will have the gorgeous and powerful obituary cocktail. If you are unfamiliar with the taste of absinthe, this classic cocktail may take some getting used to because it has a very strong anise flavor. This is also not the tamest of drinks and it may be best to limit yourself to one; take the name as a warning. This drink is a sweet and easy vodka cocktail that can quickly become a favorite mix for any occasion. It is the garnish, however, that gives the mad eye martini that creepy Halloween vibe. The eyeball garnish looks disgusting but you will be surprised at how delicious it is. It's made with lychee, red fruit preserves, and a blueberry and it is the perfect complement to the Hpnotiq-vodka-lychee cocktail it adorns. There are a number of ways to make a black martini and one of the best tasting recipes includes vodka, blue curaçao, and black raspberry liqueur. They combine to create a very dark cocktail that hides a delicious fruit flavor no one will be able to resist. Rarely will you find an infusion with scotch, but a recipe like the great pumpkin offers inspiration of the possibilities. For this recipe, you'll add the flavor of roasted pumpkin, which works really well with the whisky. You will have to allow a couple of days for the flavor to reach its peak. Once you that, simply mix it with ginger liqueur, lemon, and maple syrup. It's a sophisticated twist on the average pumpkin cocktail and an impressive flavor combination you will not forget anytime soon. This midnight martini is an easy vodka cocktail that requires just two ingredients and, as the name implies, it is dark as night. This one will also help you stay alert through the party! The combination of espresso vodka and your favorite coffee liqueur creates a tasty and high-octane cocktail. If you want a little extra dimension, add cinnamon syrup for a sweet and spicy touch. One of the many cocktails to take on the name, the corpse reviver no. 2 is a classic cocktail that may just wake the dead. It makes a stunning addition to any party and will impress guests with even the most sophisticated of palates. The mix is one of gin and Lillet Blanc or Cocchi Americano with an orange liqueur and a dash of absinthe to liven everything up. Even if you are not entertaining for Halloween, this is a drink that's worth trying. Halloween is the perfect excuse to play with color. 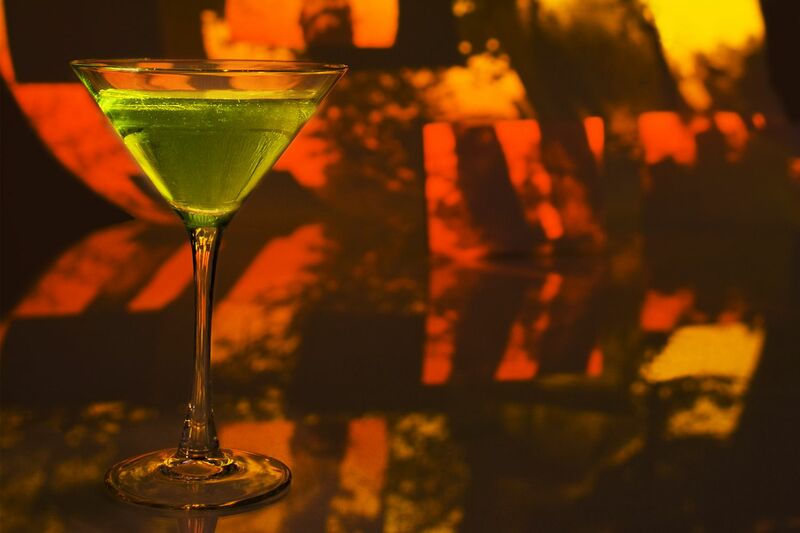 If you're looking for glowing green cocktails, a melon liqueur like Midori is essential. It makes an appearance alongside vodka in the spider's kiss, which is eerily enhanced by a web of chocolate, and it doesn't stop there. A drizzle of grenadine finishes off this fruity drink in bloody style. You cannot have a Halloween party without some sweet treats and the ghost-tini recipe packs in the yummy flavors. The drink mixes Irish cream with vanilla vodka and pumpkin liqueur, though the goodies are in the garnishes. Don't forget the chocolate cookie rim or the squiggly gummy worms. Give your perfect martini a citrus boost in this stunning and easy cocktail. The satan's whiskers recipe is quite simple. Choose your favorite gin, add both sweet and dry vermouth along with a little Grand Marnier. Dose it with some fresh orange juice, then orange bitters and you have a citrus cocktail that is a flavorful delight. A ton of fun and incredibly easy to mix up, it's hard to pass up the ghostbuster! It's a very light martini that is a fruity mix of peach schnapps and melon liqueur. And, when you drop in a little Irish cream, a ghostly apparition makes an appearance that's sure to delight all who catch a glimpse. What's a Halloween Party Without Bloodshot Eyeball Deviled Eggs?